The Agege community on Thursday, 15 March, 2018, rose in unison to endorse Governor Akinwunmi Ambode, Rt. Hon. Mudashiru Obasa and Hon Oluyinka Ogundimu for another term in office. The community at a rally in Agege agreed that Ambode should be re-elected to continue in office as Governor of Lagos State; Rt. Hon. Obasa should be supported to return as the Speaker of the state House of Assembly; and Honourable Ogundimu should be re-elected as member representing Agege Constituency 2 in the state House of Assembly. The Vice Chairman of All Progressives Congress (APC, for Lagos West Senatorial District, Chief Funsho Ologunde; APC chieftain and member of the Governor’s Advisory Committee (GAC), Professor Tunde Samuel; Iyaloja General for Lagos State, Chief (Mrs.) Folashade Tinubu-Ojo who spoke at the event confirmed that in view of the huge achievements of the Ambode administration particularly in Agege, it becomes imperative for Agege people to endorse not only Ambode but also Rt. Hon. 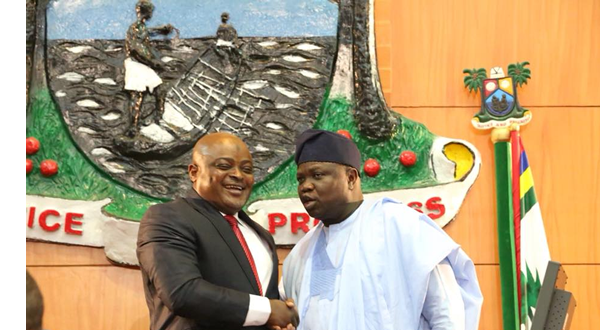 Obasa and Ogundimu both of who have been playing supporive roles to Ambode as Speaker and legislator respectively. “Ambode has turned Lagos to a construction site and Agege community has been one of the major beneficiaries of the current administration in the state. Both Obasa and Ogundimu have been playing the needed supportive roles for the Governor. Therefore, for this good work to continue, I urge you all to support our Governor, Speaker and Ogundimu for another term in office,” Chief Ologunde said. This was re-echoed by Chief (Mrs) Tinubu-Ojo who was represented by Alhaja Toyin Kudus. The communique confirming the endorsement for the trio signed by prominent people in Agege was later read by former Chairman of the local government who was also a former member of the state House of Assembly, Hon Rotimi Adeshina.